The look is sleek, open and international. There are comfortable high chairs and cosy “love seats” around a snazzy bar designed by Russell Sage, once the star of London Fashion Week (where he specialised in women’s fashion) but now in demand as an interior designer in London. There are cocktails sitting inside bottles, waiting to be shaken up with squat squares of monogrammed ice. The bartender is busy infusing botanicals into vodka via sous vide. There’s a twist to the classic negroni, I am told, and meanwhile, the home-made limoncello that finds its way to the table is near-perfect. I could be at any bar in Milan or London but for the food that will follow. At Comorin, at Two Horizon Centre in Gurugram, the feeling the space evokes in us and its drinks may be firmly international, but the food comes with solid Indian pedigree. “This is the first time we have attempted something like this, so it is a bit of a risk. But I really wanted to do a young and contemporary cocktail bar,” says Rishiv Khattar, director of Old World Hospitality and restaurateur Rohit Khattar’s son, who had been studying and living in the US for the past dozen years. What Rishiv has done is not just open a snazzy cocktail bar, but one with Manish Mehrotra’s food to raise the bar further. Officially described as a “hybrid”, Comorin is a bar, a coffee bar, a retail zone for Indi food brands and a coworking space, too. At its core is a global sensibility that is so different from what we have seen before from Old World Hospitality, with its focus on Indian food. After all, the company’s most famous brand — helmed by chef Manish Mehrotra — is Indian Accent, the face of Indian gastronomy for about a decade now. 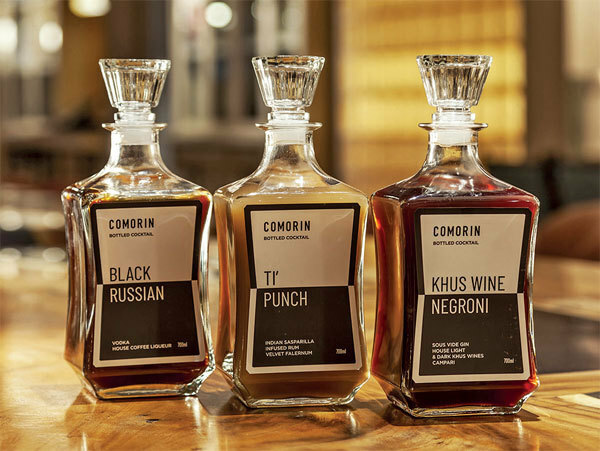 Comorin is definitely different — yet it is also part of a continuum. The bar is chic, the cocktail programme inventive and unlike anything else in India (sous vide, nitro brew, etc) but the food is firmly inventive Indian — Manish Mehrotra style. Dishes are simpler than Indian Accent’s complex plates, yet you can spot the same detailing, ingenuity and coming together of different strands into a unified narrative that is the hallmark of Mehrotra’s cooking. There are mini fried idlis with lime-accented podi, the citrus lifting the snack from the simple to chef-quality. There is a creamy corn khichdi with the now elusive fried sem ka beej (a traditional namkeen made out of dried bean seeds in areas of Agra, Bundelkhand and Rajasthan), sookhi moong dal served with edamame, Kanyakumari crab claws with Trishna-style butter-garlic masala, bacon- filled bread pakora, Alwar milk cake ice cream and even dishes like seekh kebab topped with melted butter (done in the style of an old-Delhi shop) and a Champaran meat curry made in mustard oil. The idea is to do deceptively simple dishes that may be easy to eat but on closer inspection show up their class. While some are Mehrotra’s inventions, others are inspired by “other people’s inventions”, he says, pointing to dishes like the butter seekh kebab, crab butter garlic and even the Champaran curry that never quite existed until two years ago, when regional Bihari food took off. These are urban legends and Mehrotra’s recreations are inspired by these. Obviously, these are elevated by highquality cooking that you expect from a chef of his calibre. What is certain is that this kind of gourmet, chef-led menu is not something that you necessarily expect at a bar, though Mehrotra says the idea was to do “simple plates that do not overwhelm and take the attention away from such a high-tech bar”. That India’s most successful chef should take up a bar project (he has done this on a consulting basis), as his first project outside Indian Accen .. Unlike the rest of the world, where bars are bars and a firm line divides bars and restaurants, in India, the line often gets blurred. Food has always been important in bars because culturally, the Indian diner has never been comfortable with the idea of going out for drinks before or after meals at home. Instead, people drink and nibble (the whole genre of chakhna emanates from this lifestyle) and then eat a hearty (usually carbladen) meal after the binge. Now, instead of the tikkas, kebabs, momos, even so-called “modern Indian” (just a better name for chatpata mishmash), cafeised street dishes and done-to-death menus, a new generation of bars are putting out serious chef-led menus. 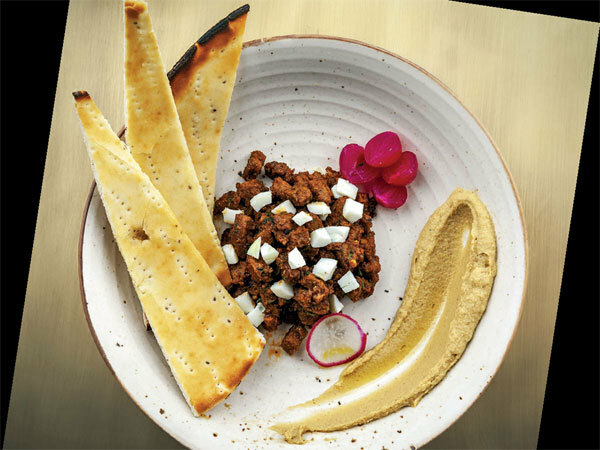 If Comorin serves up Manish Mehrotra’s creativity on a platter, there are other top chefs and restaurateurs who are also bringing fine-dining finesse into bars they lead. Comorin’s neighbour in Gurugram is Whisky Samba, a two year old bar known for the biggest collection of whiskies in the country as well as whisky-based cocktails. 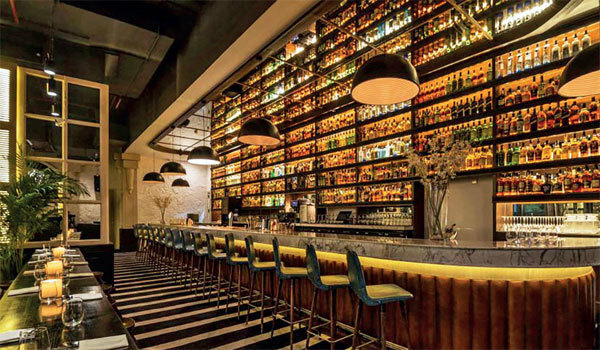 Anecdotally, Whisky Samba does some of the biggest business in the bar space in the country. Earlier this year, its coowners Ashish Kapur and Joy Singh decided to bring in chef Vikramjit Roy, who had earlier helmed the fine dining Tian at ITC Maurya, as corporate chef to lead their entire group, focussed on bars (apart from Whisky Samba, sister outlets include The Wine Rack and Antares in Mumbai and Goa). Roy’s first step has been to revise the menu at Whisky Samba (there have also been new menu. On the Saturday evening I visited, the place was packed with no tables available and with scarcely space to stand on your toes. Yet, Gurugram’s consumers were ordering big and small plates with their drinks. Tables had serious dishes such as bone marrow in rasam, bourbon smoked lamb, and yellowtail and scallop carpaccio, more to be found in a high-end Japanese restaurants than Gurugram’s drinking establishments. The biggest surprise, however, is Roy’s take on his Bengali roots. While he has always been known for his Asian cooking (he was an opening chef at Wasabi in Delhi), at Whisky Samba, what is unmissable is dishes that he describes as being part of his “nostalgic journey”. There are curries like “my grandmom’s pumpkin curry” and “aam kasundi fish”, with flavours of raw mango and mustard, all upped with top-notch professional cooking. Some are paired with breads like poi, others with red rice and such. These chef recreated homestyle flavours are being lapped up by Gurugram’s party goers. For the restaurant itself, this has been a revelation. “We have always done great liquor sales. However, the idea was to do both great food and drink sales. If customers can get great food inside a bar itself, why would they need to go elsewhere?” points out restaurateur Ashish Kapur. In Mumbai, Karyna Bajaj of KA Hospitality (that owns Yauatcha, Hakkasan and Nara) says that her heart was set on opening a place with Italian wines — non-intimidating and easy to drink in. She opened Cincin last year in BKC, where all the 40-odd wines (which they keep changing depending on availability and include some quality Indian and new-world ones, too) are available by the glass. 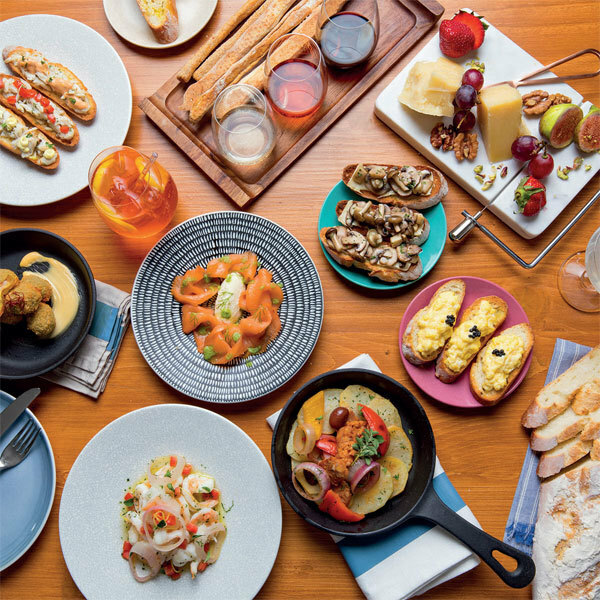 As part of the casual, young vibe, there’s “good wine at good price” in stemless glasses so “you don’t have to feel intimidated swirling and sniffing”, there are cool cocktails by a 25-year-old Italian mixologist, and small plates of food (ciccheti; inspired by Venetian bars) accompanying the drinks. However, Bajaj has been particular about her food research, too. “Before I opened, I went on a trip to Italy and saw the food in various regions and I enrolled in a cooking school to learn how to make fresh pasta,” she says. While bars have typically focussed more on their liquor sales, the new players blurring boundaries aspire to a 50:50 ratio vis-à-vis food and beverage sales. Food that is distinctive, well researched or created by a top chef becomes important in creating a longer lasting brand that cannot be replicated by all the me-toos in the market. Top Indian bars may have borrowed the idea of upping this game from big blingy places in Dubai — like Zuma and Coya, which work both as fashionable bars and destinations for gastronomy and have been attracting a steady Indian clientele from Delhi and Mumbai. “It is only a city like Dubai that has seen such a phenomenon. In London, the US and Hong Kong, sometimes bars don't even offer you chips, says Gauri Devidayal of The Table, who, earlier this year started the cocktail lounge Miss T in collaboration with the Woodside Inn team. 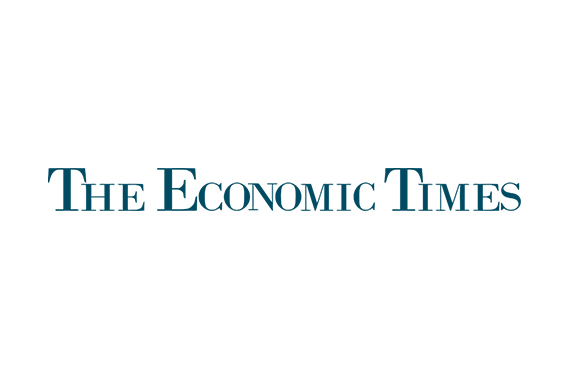 Chef Bawmra Jap from the eponymous Goa restaurant Bomras was brought in as a consultant. ¡§I was blown away by what he did at a pop up. He has a huge following and no one else does his kind of food, Devidayal says. Miss T also has mixologist Jeremy Buck who has worked in some of the best bars in New York. Both are equal stars. It is really tough to keep an equal emphasis on both food and drink. In India, chefs are stars but mixologists are not recognised. So, if a bar has a great chef, it needs to be careful about keeping that thin dividing line intact. Sometimes, we have people asking us whether they can eat at the bar and we have to educate them and maintain the character of the bar, says Devidayal. It may be a tough balancing act for restaurateurs to raise the bar with gourmet food but for people like us, it is the best of two worlds. May they always meet.